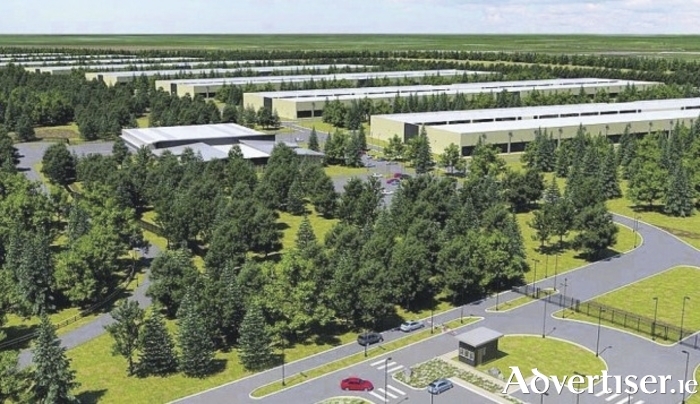 Plans by tech giant Apple to develop an €850 million data centre outside Athenry have once again been given the go-ahead this week with a decision by the High Court to reject an eleventh-hour appeal by two local residents. The pair had sought to challenge the court's previous decision to refuse their application to have planning permission for the development overturned. Allan Daly and Sinead Fitzpatrick had previously challenged the grant of planning permission for phase one of the proposed facility in Derrydonnell, arguing that An Bord Pleanala had not carried out a sufficient environmental impact assessment of Apple's overall plans before granting permission for the development, which comprises the first of up to eight data halls on the site. Mr Justice Paul McDermott last month refused their application to have planning permission overturned. Yesterday the judge rejected their application to appeal this earlier judicial review finding to the Court of Appeal. Mr Justice McDermott said he was not satisfied there was an appropriate point of law for the objectors to continue to seek to block the data centre, or that it should be appealed in the public interest. Lawyers for Apple and An Bord Pleanála, which approved the scheme in 2016, told the court they were making no application for costs against the objectors. The latest decision has been broadly welcomed by local campaigners supporting Apple's plans for the area, many of whom travelled to the capital yesterday for the latest High Court decision. Minister for the Diaspora and International Development, Ciaran Cannon, has said the judicial decision "heralds a new dawn for the industrial life of Galway". He added: "While it is wonderful that Galway city has continued to grow as a business centre in recent years, one can understand the frustration of people in the more rural parts of the county at the dearth of large-scale employers. Today's decision means that this frustration will be greatly mitigated and that Athenry will soon be positioned to take its place among the very best of regional developments. "As an elected representative for Galway East and a proud native of the county, I know only too well how much a matter of concern this has been to the people of Athenry and of Galway in general," he continued. "I have been in regular contact with An Taoiseach on this issue and I wish to thank An Taoiseach, Leo Varadkar, who has maintained contact with senior executives in Apple and has been on Athenry`s side from the outset. "This case has highlighted the need for a thorough examination of our planning and legal systems as they apply to large developments of this nature, and that examination will most assuredly happen as we cannot permit our international reputation to be damaged by events of this kind. The more immediate concern is moving on and beginning to create the new future that Athenry and the west of Ireland so fully deserve. The people of Athenry and Galway will prove that they are fully equal to the challenge of embracing a new industrial dawn and I have every confidence that they will justify the faith that Apple has placed in them." The objectors now have 28 days to seek to appeal this week's judgment to the Supreme Court, which would consider an appeal in exceptional circumstances.